From the Baldwin County Courthouse, go east on Hancock St. one block. Turn right (south) on Wayne St., which becomes Business 441 South. Go 0.9 mile to the Vinson Highway (Hwy 112). Turn left at on the Vinson Highway. Go 6.6 miles to Benson-Adams Rd. Turn left and go 0.7 mile (Note that Benson-Adams Rd turns into a gated field road at 0.5 mile). 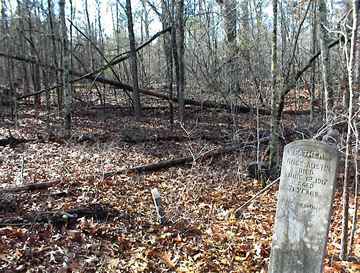 Cemetery is located on the left side, approximately 150 ft. off the road, in a grove of trees. In 2002, it was easier to walk beyond where you would turn into the woods to go to the cemetery; instead go past where you think the cemetery should be and follow a road-like opening on the left. Turn left off the road-like area and enter the woods (and the cemetery) from the back (or southern) side. The cemetery is very large, approximately 150 feet by 300 feet. Age 71 years. "A loving father"
"She lived a Christian life" signed "Peter Smith". Possibly as many as 4-5 unmarked graves in this area. The name appears as "David-Williams". s/o Clara and Ruben Risby. About 3 or 4 graves in this area. A metal funeral home marker with no name marks the grave. Four unmarked graves with headstones. An iron post marks the grave. w/o Tom During. "At rest"
d/o Rubin and Clara Risby. "Asleep in Jesus"
s/o W. P. and Clara Hall. No dates. Name scrawled into cement slab. b. Baldwin County. w/o Elisha Davis. "Our dear mother." Two-three depressions in this area. No dates and no 's' on the end of William. There are too many unmarked graves in this cemetery to count them accurately.